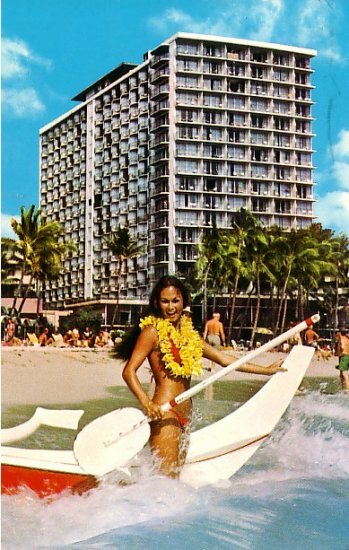 Standard Size Chrome Postcard in good, posted (Honolulu, Hawaii) Condition. This post card was made by Mike Roberts Color Productions of Oakland, California. "The Outrigger Hotel located on the beach in the heart of Waikiki - Honolulu, Hawaii, offers the best swimming area in the Islands. Every room has an ocean view and a private lanai, TV and refrigerator. Shops, restaurants, coctail lounges and nightclub attractions are featured."